Well Chelsea played it exactly as they should have and they should have won this game 2-0. But, that’s what happens when you don’t score the second goal and have to worry about the away goal. It happened to Man U against Porto to launch Mourinho’s career and it happened again today. Messi and company were choked just as I said they would be. One real shot on goal and they scored in injury time. Doesn’t get closer than that. Chelsea deserved this win. They should have had two penalties. But it was a questionable red card for Abidal. What’s with these referees? They don’t seem to talk things over with their linesmen for very long before handing out red cards. It’s ridiculous. Anyway, now it’s Man U vs Barca in the final. Messi and Henry. Rooney and Ronaldo. Barca without both wing backs and Marquez, but with Henry probably back. Man U without Fletcher. Should be awesome. More awesome – I will be at the final! Who would have thought pre-tournament that France v Italy could have no meaning for either side? As it stands, if the two draw, Romania would go through unless they lose by more than three goals. If, however, Romania doesn’t beat Holland, the winner of the France v Italy game goes through. France has apparently not lost to Italy in regular play over 90 minutes since 1990. While this is too close to call and Panucci and Chiellini don’t really inspire that much confidence in me, and Zambrotta is going to be struggling against Henry or Ribery, I think Italy wins this match. Buffon is going to be tough to beat and will make the difference. Also, Italy has been creating chances – they just haven’t been able to score. I think that changes today. 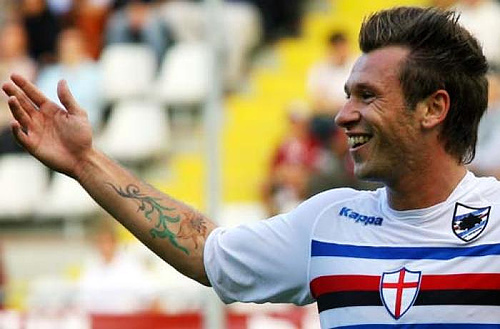 There have been rumblings that Cassano is going to start alongside Toni. I think that’s the right move. He’s been very creative and slippery while playing in the hole behind Toni. That’s the way we assume Del Piero would have played, but he didn’t do much in the last game. So start Cassano on the left behind Toni and keep Camoranesi on the other side to do a lot of the running. The midfield has got to start Aquilani alongside Pirlo and De Rossi. While there may be a desire to start Gattuso, given the magnitude of the game, I would not do that. Aquilani and De Rossi are more offensive minded players and De Rossi can play the holding role very well. Bring Gattuso on late in the second half if you are ahead and need to protect the lead. Aquilani has a very good shot, is good going forward and has young legs, which you are going to need today. Perrotta is not the answer for this game. For France, it is simple. Play the best team, Domenech. Here, I will do it for you. Henry and Benzema up front. Ribery, Nasri and Malouda behind them, with Maka or Diarra as the holding midfielder. While Toulalan has played well, I think Diarra has more quality going forward. Evra, Gallas, Thuram and Sagnol at the back with Coupet in goal. If you are scared of this lineup being too aggressive in the first half, start both holding midfielders and drop Malouda. However, you need to be aggressive and try to score the first goal. You are not playing Turkey, so you should be good if you score the first goal. Romania – everything seems to be in your favor. The Dutch will be aggressive and open but without their best players executing the total football game plan. That plays into your hands. Plus, you have taken four points out of six from them in qualifying. So you know their personnel and style. Just don’t give up the first goal to the Dutch and you will be fine. The other issue, of course, is that you are going to have to play for 90 minutes without a let up as the Dutch are going to try to score, and are capable of doing so, for 90 minutes. Don’t give in to the temptation of starting only Mutu upfront. That’s fine as far as the lone striker goes, but you have to have at least two wingers close to him and coming up with him in attack all the time. That’s how you can score against the Dutch on the counter. Looking forward to Huntelaar starting. Rat, get ready for a tough game – you are going to have to excel. CH12 predicted that France and Holland go through. It will be interesting to see if that happens. I don’t think so, as I believe Italy will beat France. Domenech – bring on Benzema at halftime for Gouvou – you need his heading ability as Henry can’t head. Bring on Nasri for Toulalan or Maka at the 55 minutes mark if the score is still the same. Evra needs to overlap more down the left flank. Van Basten – get your team to counter attack with more speed. You have to get one more soon or it’s going to be tough at the end. France will come forward increasingly. Bring on Van Persie or Robben. The crystal ball changes from minute to minute. This is a tough one. If the Dutch show up the way they did against Italy and the French show up the way they did against Romania, it’s relatively easy to call the Dutch winners. However, I think the Dutch drop a bit, even with Van Persie possibly starting and the French do better simply because the Dutch will not have 10 men behind the ball like Romania. There will be more space for the French midfield. I also think Andre Ooijer and Joris Mathijesen are going to have a much harder time with Benzema and Anelka/Henry/Gomis. Domenech needs to start Nasri so that there is more speed and energy going forward else the French midfield will be overrun by the faster Dutch set up of Van der Vaart, Engelaar and Sneijder. Toulalan and Maka should be enough to slow down the Dutch and give the defense numbers against Ruud and company. Unsure of how solid Gallas and Thuram are in the middle of the park since Romania didn’t really test them. Should be a barnstormer. I still can’t figure out how to call it, but I think there will be goals and I think its a 2 all draw, with the French the more likely to win the game. Will update once we know the Italy v Romania result.